In today’s environment, operators responsible for retirement homes and facilities for assisted living have to face multiple challenges. The main reasons for this can be identified in the increasing cost pressure, the shortage of trained nursing staff as well as the rising operating and safety regulations. To cope with all these challenges, it is of crucial importance to reduce the operating costs, to optimise current work processes and to relieve the staff workload. Here, an alarm and information system definitely plays a decisive role. New Voice MobiCall offers an efficient alarm transmission from the nurse call and antiwandering systems to the responsible nursing staff, but also the transmission of fault reports to the housing technology, the “silent fire alarm” in accordance with the regulations in force, and people protection. A major advantage of this solution is that heterogeneous systems of all leading manufacturers can be integrated. So,, every alarm and information scenario can be managed centrally. Thanks to a sector specific and process-related administration surface, management and configuration of the alarm parameters are designed to be particularly user-friendly. Based on events, MobiCall can interactively alert the responsible nursing staff, service staff, in-house technicians, security officers, as well as the director and external stations, both individually and on a group basis. For this purpose, all existing media are available and can interactively be controlled. Basic components of the infrastructure are the nurse call system and emergency call terminal devices. By means of an emergency button, residents can easily ask for assistance to the nursing staff at any time. 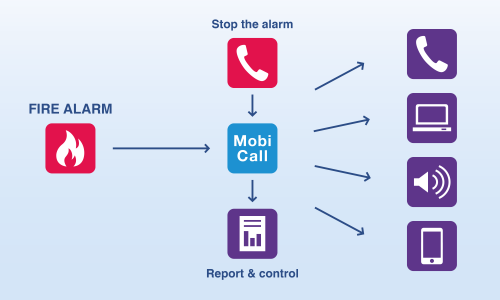 MobiCall allows the interconnection between the emergency call and the communication systems, thus facilitating a targeted transmission of detailed alarm information (such as name, room number and alarm type) to the terminal device of the responsible nurse. Depending on the confi guration of the solution, the alarm recipient can acknowledge the alarm receipt either positively or negatively. If after a predefined time, the alarm recipient wasn’t achievable or a negative acknowledgement failed to occur, alternative people and/or representatives could be alarmed. The system also offers a time- and calendar-dependent information distribution, offering a customizable representation of availability lists and duty rosters. All alarms and procedures are logged and archived, thus allowing to the system to provide a complete documentation. 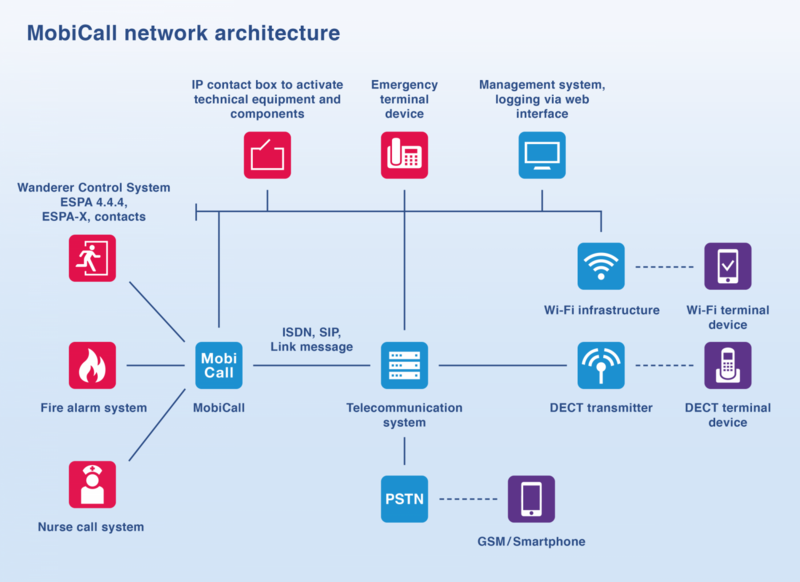 Of course, MobiCall is also suitable to connect anti-wandering systems in order to directly transfer alarms as well as technical faults. As a consequence, this solution minimises walking routes and stress for the staff members, while improving response times in case of emergency calls. This involves on one hand more chances to save a life, and on the other hand an enhancement of the residents’ well-being. In emergency situations, like fire or disaster alarms, an immediate mass alerting is necessary. 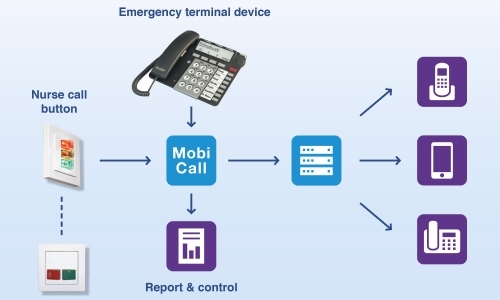 With MobiCall the existing infrastructure can be used, so that telephones and computers in use are available to transmit an acoustic or optical alarm. Depending on the fire regulations, the information transmission can also occur as “silent alarm” to reach the responsible nursing staff, the fire safety officers as well as the evacuation assistants. Thanks to standardised and manufacturer-specific interfaces, MobiCall allows to transfer detailed information, such as room name and floor of the fire alarm, to the terminal devices of staff members. This permits an immediate tracking of the alarm location, thus reducing the risk of false alarm. If need be, a sectorial alerting can also be implemented in addition to a general evacuation. Multimedia alerting via telephone, smartphone, PC client, IP loudspeaker..
MobiCall, with its variety of interfaces, allows a real time monitoring of all subsystems, such as basic process control and display systems, as well as building management system and ICT components. When faults or critical thresholds occur, the detailed alarm information and process data are automatically conveyed through the cross-platform to a defined group of people. The integrated task management is a major advantage of this solution, ensuring faults classification and tracking. The whole process, starting from the alarm trigger up to the troubleshooting including the usual SLA times, can be monitored and displayed. 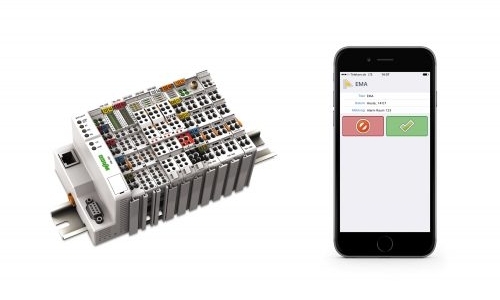 IP integrations via Modbus, KNX, BACNet, OPC, XML, e-mail, ESPA-X, HL7..